Massive, modern-day disasters that shake countries to their core come in many different forms. But whether they’re natural like hurricanes or man-made like mass shootings, the nations they befall are almost always able to move forward in large part because people can explain what happened. How, though, does a country or even a city come to grips with a tragedy that is unlike anything the world has ever seen, and fundamentally changes people’s lives? Those are the kinds of questions that Robert Kirkman and Lorenzo De Felici upcoming comic Oblivion Song from Image asks while its characters struggle to find an answer. Unlike Kirkman’s wildly successful The Walking Dead, this new series isn’t quite a story about the apocalyptic collapse of society; instead, Oblivion Song’s about a group of people so shaken by a mysterious event that, in time, many people begin to find it easier to effectively block it out without really trying to understand it. Ten years before the comic begins, 30-square miles of land from another dimension are suddenly transposed into an American city. With the “Transference” come hordes of gargantuan monsters and a strange fungus-like substance that eventually leads to some 20,000 people being murdered. In time, the city is able to reclaim some of its territory and drive most of the creatures behind a wall that separates them from the slice of interdimensional wasteland that lies beyond. Initially, there are missions into the wasteland to search for human survivors trapped beyond the wall, who are forced to fend for themselves, but as time goes on and fewer and fewer survivors are found, interest and governmental funding into the recon/rescue missions beyond the wall begin to fade. At the center of the story is a man named Nathan, a passionate proponent for the searches who has theories about what the Transference is—but there are those around him who are unwilling to consider them, out of fear of what they could mean for future Transferences. While society is ready to count those still missing as dead and move on from what happened, Nathan’s obsession with the event and the possibility of saving more lives drives him to question why everyone else is so ready to let go. When I spoke with Kirkman this week about the series, he explained that while the first few issues establish Nathan as being something of an outlier in his preoccupation with the Transference, the larger plot will explore the various ways that people are managing their thoughts and feelings. 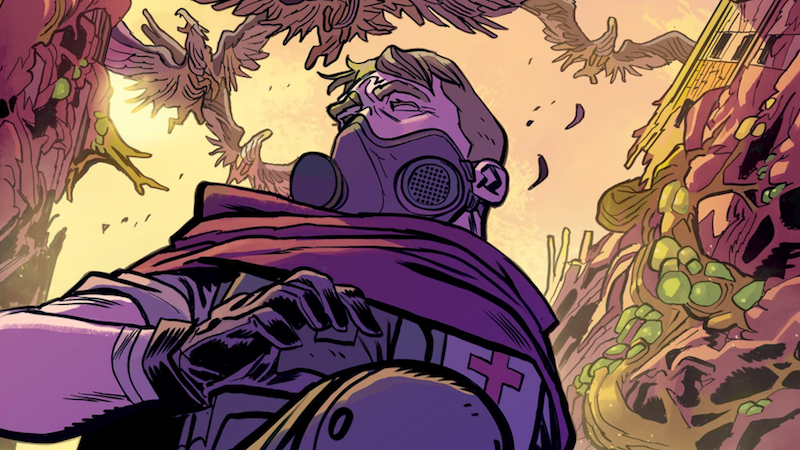 io9: Nathan’s loss and inability to let go of hope that there are more survivors out there is the primary focus of Oblivion Song’s first three issues, but going forward, what other aspects of this world are you building out? Robert Kirkman: Individually, I want to explore how [the Transference] can hurt people’s lives irreparably, but also improve some people’s lives and set them on a path that they wouldn’t have been on otherwise. In that sense, there is some good that can come from these things. What is it that makes Nathan unable to leave behind those people in the quarantined zone who seem to be thriving there? Kirkman: There’s a very important component to this that will be revealed later in the series, but it’d be a spoiler to talk about now. But there is certainly something about Nathan that won’t allow him to do that. It’s important for him to bring those people back and it’s very odd for him when he encounters people who don’t understand that. Judging from the first issue alone, Oblivion Song kind of comes across as an apocalyptic story, but you soon learn that’s not the case. Within the safety of the walls, people are trying to get back to their everyday lives, but I’m curious, are they just going through the motions or do they really see longterm futures for themselves? Kirkman: I think for people on earth, it’s a situation not entirely unlike our relationship with North Korea. There’s the possibility of a nuclear missile attack, but it’s not going to keep us from buying groceries. They may be aware of the Transference and the fact that no one really knows what caused it and how it might happen again, but at the same time—it the sort of thing that no one can really prepare for. Given how actually apocalyptic the real world can feel at times, how would you go about telling a new story about a fictional apocalypse that didn’t feel redundant? Kirkman: [laughter] You’re trying to get me to say things that are going to get me in trouble and I’m not going to do that. You know, I know don’t really know. These are trying times for most people out there and when that’s the case, people need more catharsis from fiction. Anything apocalyptic that I might make now would have to be a bit more uplifting than The Walking Dead. Oblivion Song hits stores March 7, 2018.